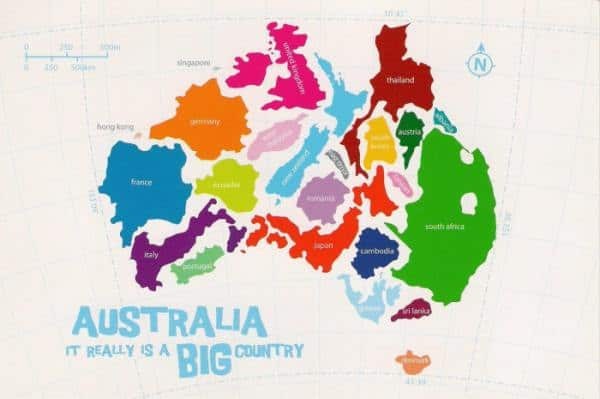 Do you Really know how Big Australia is? What an amazing perspective this gives to someone considering a move to Australia. Our land is absolutely huge – almost 3 million square miles, or 7.8 million square kilometres. So next time you consider cycling from Perth (far west) to Brisbane (far east) – think again! – if your name is Brendon Sinclair you might just do it, but for the average punter this would be a three month trip! If you’re thinking about migrating to Australia, it pays to consider where you would like to live – each State is uniquely different in terms of climate, surroundings and facilities.